EasyTac downloader is compatible with all industry-standard smartcard readers. 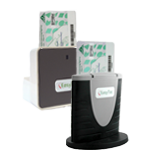 To download data from a driver's card you need a smartcard reader. This device connects to the PC, usually via USB, and enables data to be read from any EU issued driver's card. The reader will not read the card without software such as EasyTac downloader. EasyTac downloader reads drivers' cards and writes the data into standard tamper-proof files as required by the digital tachograph legislation. The data is then used to create various reports such as graphs and activity tables. EasyTac downloader is designed to work with all smartcard readers that comply with industry-standard PC/SC specifications. Please ensure your reader meets this minimum requirement.